chambers increased the compression ratio to 10.9:1 and, with hotter camshafts, the output of each engine was 180bhp @ 7,200rpm with 148lb/ft of torque at 5,800rpm. Helping to achieve this was a Zenith Pierburg racing fuel injection system with one throttle body per cylinder. These were basically rallycross-spec motors. 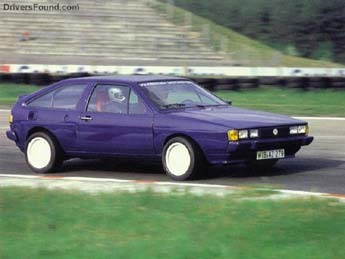 Two twin-engined Sciroccos were to be built, one for evaluation and testing and another to do shows and the like. 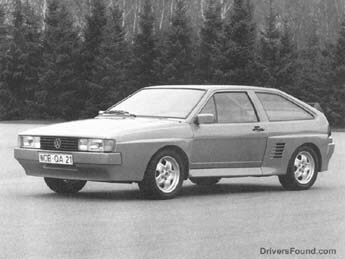 The first car was also built to convince the VW Board of the potential of the car, and it just happened to have 54bhp more than the Audi Sport quattro rally homologation special, which it equalled in acceleration and bettered in top speed, through taller gearing. VW Motorsport and Audi Sport were run as two distinct and separate departments and one detects an element of rivalry between them spurring the VW engineers on, for it was the Audi branch that was getting all the limelight in international rallying at this period. The power was fed through a pair of single-plate sintered-metal clutches to identical five-speed gearboxes. Each end of the car had a limited-slip differential and, if a high final-drive ratio was opted for, the theoretical top speed was close to 180mph. In the event, the car ran with a short final drive and this gave it blistering acceleration. 0-60mph took a mere 4.5 seconds, enough to embarrass a Porsche 911 Turbo. 100mph followed 7 seconds after that and the quarter-mile trap closed on the car in 13 seconds. 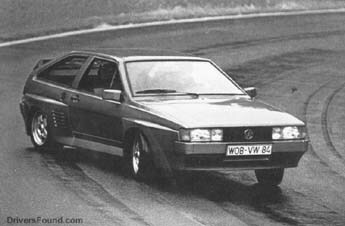 Perhaps the most ingenious feature of the twin-engined Scirocco was the way the engines were synchronised. Given the title 'E-gas', which means electronic hookup, the linking system was deceptively simple. A single throttle cable ran back to the rear engine where a potentiometer measured throttle position and sent a signal forward to operate a valve on the other engine. While the Scirocco retained the ability of the Jetta to run on front, rear or both engines, it had the additional refinement of a slide-operated throttle potentiometer which adjusted front engine power and thus the front-rear power split. The car was hardly nose heavy with a good 52.6/47.4% front/rear weight distribution, but even so it was a great advantage to be able to dial in different handling characteristics at will, especially when it came to countering understeer on loose surfaces. The gearboxes were mechanically linked by rods and cranks, with a small pneumatically operated plunger device connecting each of these assemblies near the gearbox to lock out one or the other shift mechanism in the event of a single engine failure. impress. The engine compartment surround was braced with a metal frame that formed a rigid structure from the tail panel to the bulkhead, and this was carpeted. With the engine cover in place, the whole installation was hidden from view. The interior of the car was equally neat. Instead of a battery of supplementary gauges hogging the centre console as in the first prototype, a custom made instrument panel had been assembled specially from the car by VDO who make all the instruments for VW. Fitting into the standard instrument pack hole, this contained a matching pair of rev counters with an LCD-readout speedometer in between. The bottom of each rev counter contained a small water temperature and oil temperature gauge, mirror imaged, and in the centre was the petrol gauge. The underbonnet view was impressive. Now that the factory 1,781cc engine was in production, this early 1983 prototype was able to use the new block and coupled this to Oettinger 16-valve heads. This 1800E/16 engine gave 141bhp at 6,100rpm and 125lb/ft of torque at 5,500rpm. The fuel system was a modified Bosch K-Jetronic and the compression ratio was 10.2:1.
with in one fell swoop by using a pair of three-speed automatic gearboxes. The torque convertors were modified to optimize their response and the gearbox changeup points were adjusted to suit the characteristics of the sporting Oettinger engines, and the whole set-up worked very well because the slight slip in the torque convertors would help to compensate when the two engines were running out of synchronization, as when the power balance between the front and rear engines was being modified." Copyright � 2003 DriversFound.com. All rights reserved.